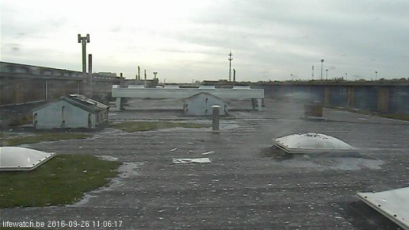 As part of the LifeWatch.be GPS tracking network for large birds, (a collaboration between the Research Institute for Nature and Forest (INBO), the Flanders Marine Institute (VLIZ), and Ghent University), a permanent Birdcam was installed in June 2013 at the rooftop of the VLIZ building (Ostend), to observe the nesting behavior of the European Herring Gulls in more detail. The live feed of this Birdcam can be accessed here. 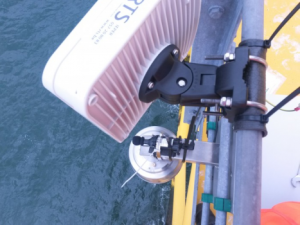 A second permanent Birdcam (AXIS Q6044) is installed at the Spuikom, a local salt water body in Ostend. The Spuikom is a popular place for water sports, and a favorite resting and foraging spot for many (water) bird species, such as the black cormorant, gulls and several duck species. The Birdcam is used for visual surveillance, but can deliver useful data on the presence and behavior of birds on this site. Tools are under development to automate processing of the imagery. This is done using a technique called dynamic background subtraction (DBGS), which is based on a median filtering. A detailed description of this automatic image analysis can found in the MSc thesis below. The live feed of this Birdcam can be accessed here. T'Jampens, R. (2016). Automatische monitoring van vogels in mariene videobeelden = Automatic detection, tracking and counting of birds in marine video content. MSc Thesis. Universiteit Gent, Vakgroep Elektronica en Informatiesystemen: Gent. 45 pp. 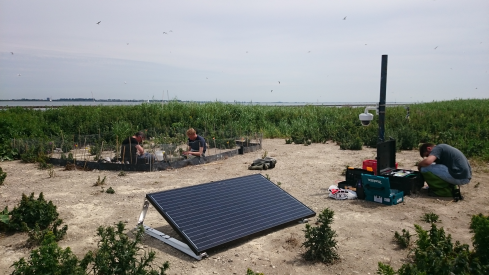 From 2009 onwards, INBO is doing research on the breeding and feeding ecology of Sandwich Terns at the Scheelhoekeilanden in the Dutch Delta area. Sandwich Terns are seabirds with a high conservation status. 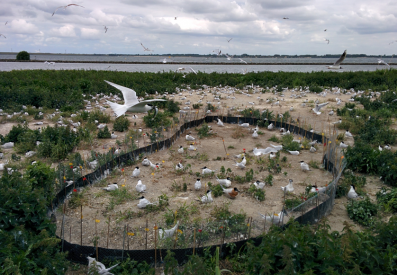 This study is conducted to assess the impact of the Tweede Maasvlakte, the seaward extension of the port of Rotterdam, on the nearby tern colonies. One possible effect of this new port could be on the food provisioning of the Sandwich Tern chicks. In order to determine what the chicks of the terns eat and to detect any changes, a part of the colony is fenced off and an observation hut is placed next to that so called ‘enclosure’. 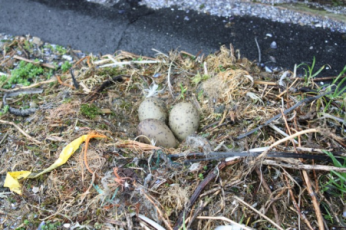 Several days per week, from the hatching till the fledging of the chicks, researchers observe and note what prey the adults bring to their chicks. In 2016, as a pilot project, a Birdcam was placed next to the enclosure in order to see if it provides a usable addition to researchers in the observation hut. The aim was to get high quality images of the colony for several weeks stored on a SD card. That way, after the breeding season, these movies can be analyzed which means all prey brought to the chicks will be identified and measured. The main advantage of the Birdcam is that we can collect data on food provisioning over a much longer time span than with ‘the old way’ of direct observations, and this on an island which is otherwise restricted to (unauthorized) people. In contrast to the other three LifeWatch Birdcam installations, which are permanent, this Birdcam system is a mobile one, and is only operational from May (start of the breeding season), until the end of July, when the Tern breeding season is over. This mobile Birdcam system is used in the research project of Wouter Courtens (INBO). 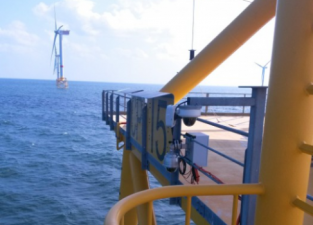 A fourth Birdcam (AXIS Q6044) is installed on the railing of the C-Power windmill WTG I5, located in the windmill farm on the Thorntonbank (Belgian Part of the North Sea). The Birdcam is accessible directly from VLIZ through the fiber-network of C-Power and an additional fiber-connection (WiFi bridge). 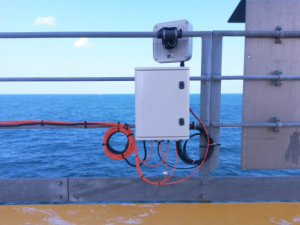 The main purpose of this Birdcam is to monitor the VLIZ measuring buoy. In addition it is investigate whether this Birdcam can be used for the observation of seabirds and marine mammals. Installation on the C-Power windmill WTG I5 (Thorntonbank), including a Birdcam, wifi bridge and BatCorder. More images about the BirdCam installations can be found in the media gallery.